Subsistence fishing and subsistence hunting are important for the economies and cultures of many families and communities in Alaska. 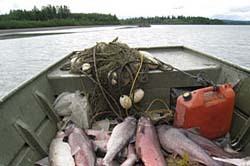 Subsistence uses of wild resources exist alongside other important uses of fish and game in Alaska and are especially important for most rural families, who depend on subsistence hunting and fishing as sources of nutrition and cultural practices. An estimated 36.9 million pounds of wild foods are harvested annually by rural subsistence users. Residents of more populated urban areas harvest about 13.4 million pounds of wild food under subsistence, personal use, and sport regulations. Learn more about subsistence in Alaska.